A new initiative in Hastings aims to get the older generation online and connected to the world. Heretaunga Seniors can now learn all about their electronic devices at an internet cafe which opened on Tuesday. Centre co-ordinator Marilyn Scott said the cafe is a logical extension of the successful digital seniors courses run at the Willowpark Road North centre and allows older people to gain knowledge in a supportive, friendly environment. “We think the internet café will be a hit with seniors in the region, because people can learn at their own pace, one-on-one with our tutors, on their own devices. We had one lady who came along to our Digital Seniors programme and managed to master her iPad so well, she was able to attend the next programme and help others get to grips with theirs,” Scott said. “The internet café will run on Tuesday afternoons from 1- 3 pm, so people can come for as long as they choose. “It could be an hour, or the full two hours. “It’s also a great opportunity to meet new people, and share those experiences overy [over] trying to get connected,” she said. Attendees are able to use Heretaunga Seniors’ wifi facilities, and there is a small charge of $3 for the first hour, or $5 for two full hours, to help cover costs. The initiative is supported by the Tindall Foundation through Hawke’s Bay Foundation, and Scott said the funding received will go towards paying a programme co-ordinator to set up and staff the internet café. 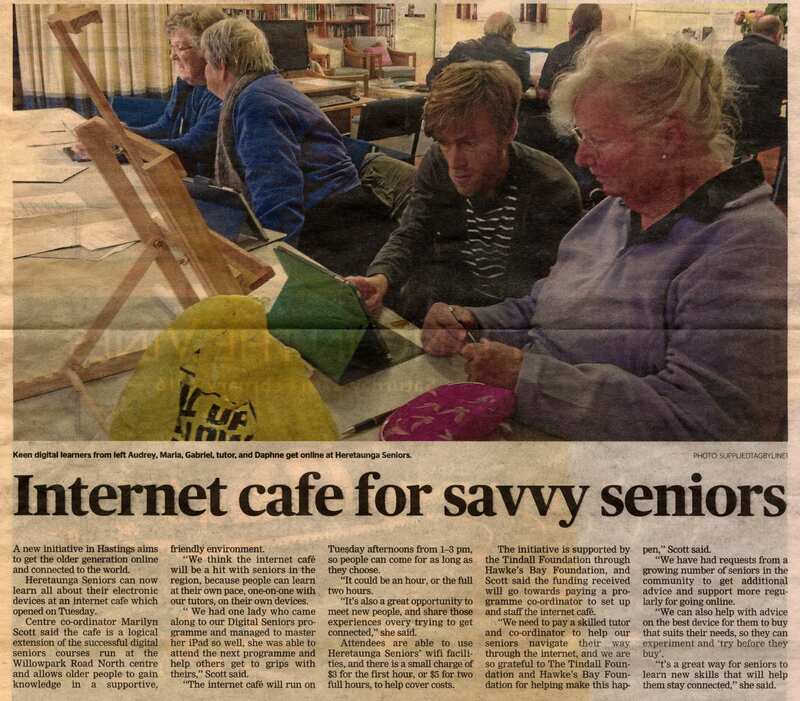 “We need to pay a skilled tutor and co-ordinator to help our seniors navigate their way through the internet, and we are so grateful to The Tindall Foundation and Hawke’s Bay Foundation for helping make this happen,” Scott said. “We have had requests from a growing number of seniors in the community to get additional advice and support more regularly for going online. “We can also help with advice on the best device for them to buy that suits their needs, so they can experiment and ‘try before they buy’. “t’s [It’s] a great way for seniors to learn new skills that will help them stay connected,” she said. Photo caption – Keen digital learners from left Audrey, Maria, Gabriel [Ward], tutor, and Daphne get online at Heretaunga Seniors.